In 1967–68, when the University of California celebrated its 100th birthday, an honor entitled "The Centennial Citation" was created on the Berkeley campus. Its object was to allow Berkeley to honor members or friends - whether individuals or organizations — that had rendered distinguished or extraordinary service to the University. At the end of the Centennial Year, the campus's leadership decided to continue the award as the Berkeley Citation. The Citation must be awarded by the Chancellor or the Chancellor's delegate at a public function — for example, a graduation or retirement ceremony. It is not to be awarded in absentia. 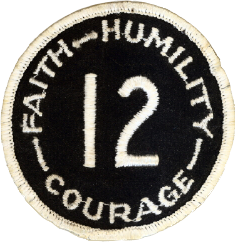 Approval of the award remains confidential prior to the presentation so that the award will come as a surprise to the recipient. The Citation may be awarded to a wide range of distinguished people or organizations, academic or nonacademic, whose attainments significantly exceed the standards of excellence in their fields and whose contributions to UC Berkeley are manifestly above and beyond the call of duty. 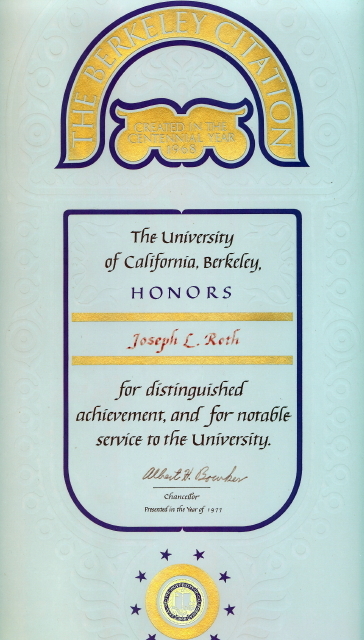 Posthumously, Joe Roth received the Berkeley Citation on June 18, 1977. View the list of recipients of The Berkeley Citation. On November 8, 1975 Joe Roth had his best statistical day as a Golden Bear and one of the best days ever for a Cal quarterback. Roth led the Bears to a 27-24 victory over the Washington Huskies by completing 24 of 36 (66.7%) passes for 380 yards and four touchdowns. The 380 yards thrown by Joe broke a school record for the most yards passing in a game which was previous held by Jay Cruze (354 yards). Roth threw TD passes to Wesley Walker (11 yards), Chuck Muncie (3 yards), and Steve Rivera (22 and 23 yards). Roth's performance earned him AP and UPI "Back of the Week" as well as Pac-8 Conference Player of the Week. Pictured below is the certificate Joe received from the Pac-8 Conference for this accomplishment. 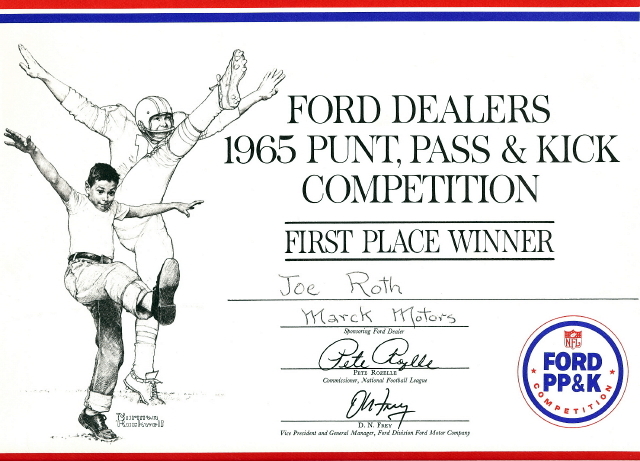 As a 10-year old boy Joe started to compete in Punt, Pass, and Kick competitions that were sponsored by the Ford Motor Corporation. In the first competition he took part in, Joe won first place in his Zone and punted the ball a record distance for a ten year old. 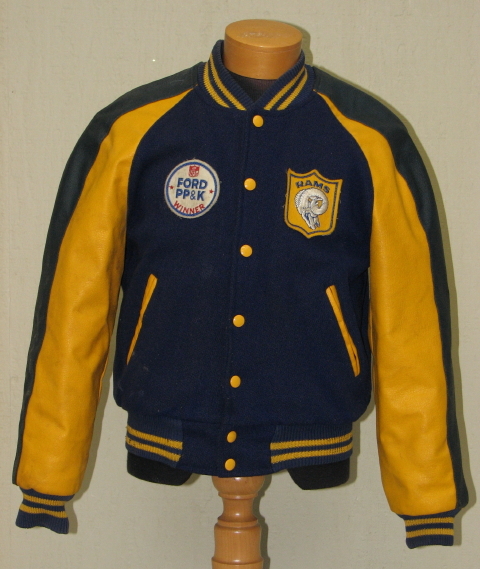 For his achievement, he was awarded a blue and gold letterman's jacket with the Rams emblem on front. Joe was said to have worn that jacket proudly until he outgrew it. 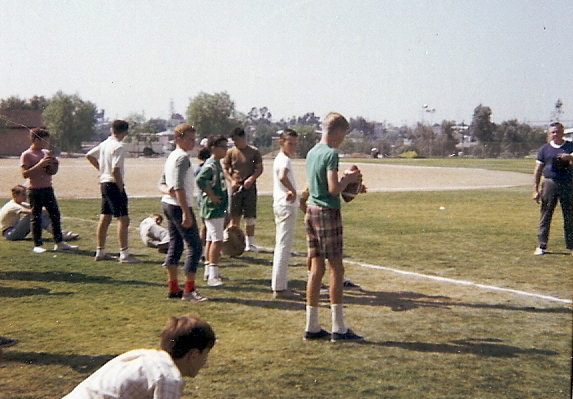 In 1966, as an 11 year contestant, Joe had won Zone and Area Punt, Pass, and Kick competitions. Joe's first place finishes made him eligible for the District competition held at the Los Angeles Coliseum during the halftime of a Rams game. 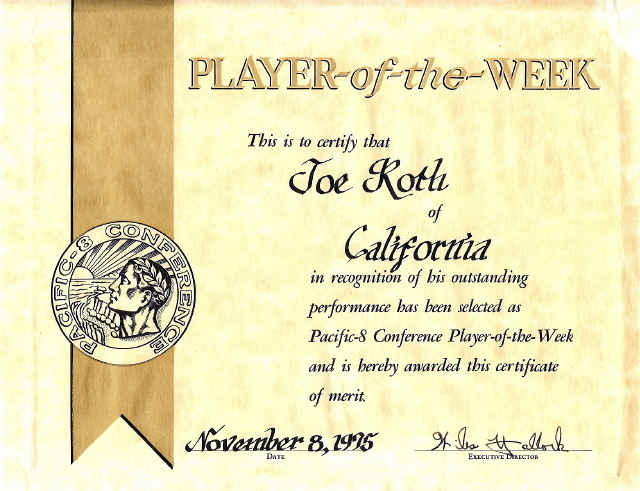 While Joe did not win that day it did give him the chance to perform on the field he would return to nine years later to play the UCLA Bruins. 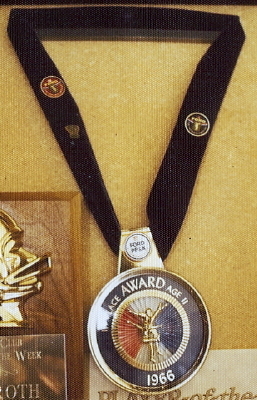 Joe won first place in his Zone each year through the age of 13. Below is a picture of the first place medal Joe won in 1966 as an 11 year old. Established in the 1930s, the Jake Gimbel Award is annually presented to the senior male student-athlete who has distinguished himself in athletics and scholarship and who has displayed an outstanding mental attitude. The winners of this award exemplifies the true "Golden Bear" spirit on and off the playing field. Joe won the J. Gimbel Award for Excellence of Attitude in Athletic Endeavor in 1977 and the medal award to his family is pictured below.